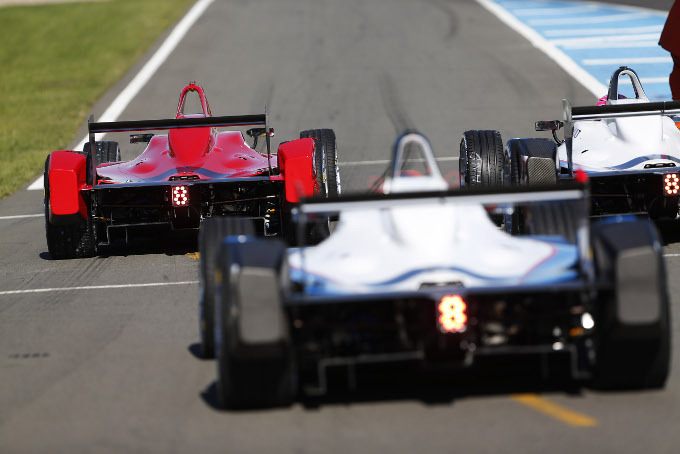 Electric Racing News - Sebastien Buemi quickest after 4 days of testing. E.dams-Renault’s Sebastien Buemi set the fastest time of pre-season testing at Donington Park with a lap of 1:31.083 to finish two-tenths clear at the top of the leaderboard. The 25-year-old beat the previous best time set by Audi Sport ABT driver Lucas di Grassi to finish quickest for the second day in a row. With few reliability problems, all 10 teams racked up the mileage with a combined total of 840 laps for the day. Ex-Formula 1 and GP2 driver Jerome d’Ambrosio ended the day third for China Racing while Scott Speed, testing for Andretti Autosport, was a place further back in fourth. Briton’s Sam Bird who headed-up testing duties for Virgin Racing in the afternoon session finished fifth with team-mate Jaime Alguersuari seven places back in 12th. Audi Sport ABT driver Daniel Abt put in a strong performance in sixth position, ahead of Nicolas Prost in the e.dams-Renault. Despite a brief visit to the gravel trap in the morning, Jarno Trulli put in his quickest time of the test so far to finish ninth overall. Nick Heidfeld taking over from his Venturi team-mate Stephane Sarrazin managed 78 laps on his way to eighth in the standings. Andretti Autosport’s Franck Montagny started the day with blistering pace, clocking his fastest time of the test so far with a 1:32.958s. He eventually improved by a further four-tenths to complete the day just outside the top-10. Argentina's Juan Manuel Lopez spent the day behind the wheel of the China Racing car and finished in a respectable 15th position. The fifth and final test takes place on August 19 with free access to fans via the Donington Park website. To pre-register click here.